One of the main things I absolutely adore about travelling is all those completely unexpected and unplanned experiences that you stumble across on your journey. For someone who was little miss organised at home, it’s a refreshing change from life at home and has led to some of the most exciting and memorable moments for me. By following my gut instincts and my heart, I have opened myself up to a wealth of experiences and opportunities to meet amazing people I would never have come across otherwise, and for that I will be forever grateful. All of my friends know exactly who they are – the girls I randomly met at the pier who I ended up sharing bungalows with and having the best girlie sleepover. The Pioneer Club who have well and truly stolen my heart after partying on the islands and getting matching bamboo tattoos. The couple I met deep in the jungle who live just an hour away from me at home – all have played a huge part in my journey. One night in Phuket was a perfect example of this, I was supposed to meet some blogger friends for dinner but I was given the wrong directions to meet them and we totally missed each other. Starving, I wandered along the street with food on my mind and found a little restaurant that looked more like a school cafeteria serving just Thai people so I headed in and had a delicious plate of fried rice and satay chicken. I ate surrounded by awesome Thai men who didn’t speak a word of English but we still managed to communicate the basics as they tried to teach me some words and tried to trick me into eating deathly spicy food. It was such a perfect example of how welcoming and friendly the Thai culture is, the group of men made me feel completely at home and despite a serious language barrier, we realised that humour is something that can translate across any language if you give it a chance. It was such a fun experience and one I might not have had if it weren’t for missing my friends. After saying my goodbyes and leaving the restaurant, I wandered down the road trying to find my way back and happened to pass an artist working in a gallery at the side of the road. Curiosity got the better of me and I couldn’t resist a peek at his work. I tip-toed into the workshop, trying not to disturb him while he worked, but he looked up straight away and welcomed me in. 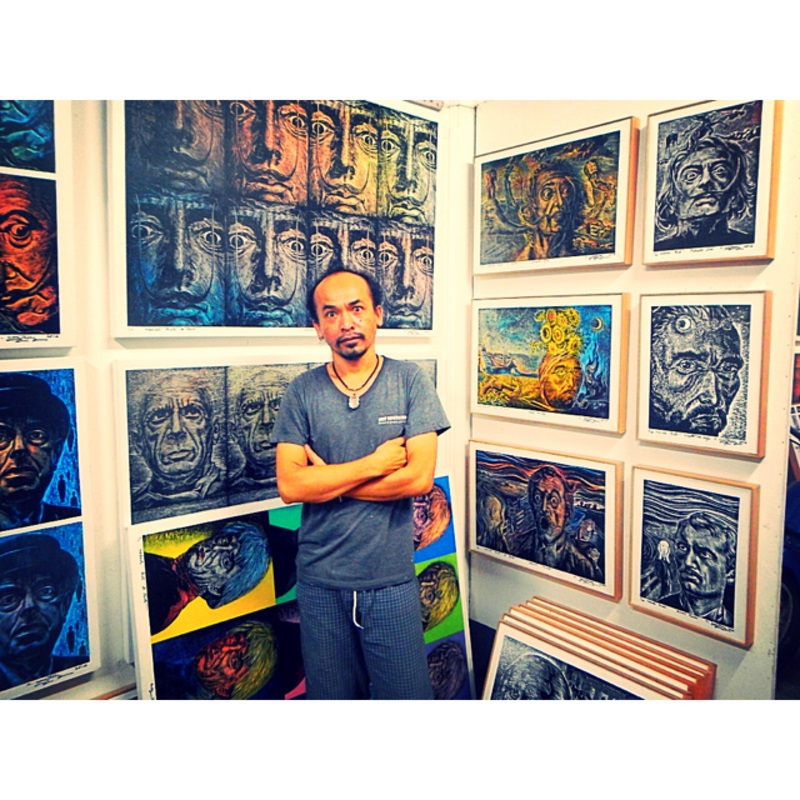 It turned out that Monthian Yangthong is hailed as one of Phuket’s, and possibly Thailand’s, most popular and talented artists who has exhibited his works all over. I was so lucky to walk in at that point because I had the amazing opportunity to see him working on his latest piece, surrounded by walls adorned with previous works. 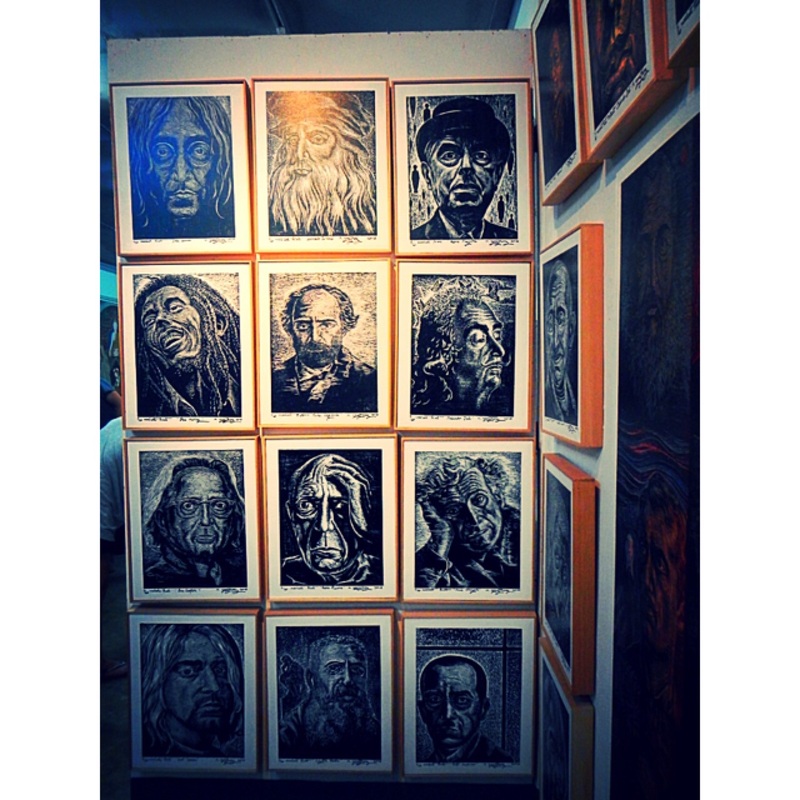 Known as “the artist who steals faces”, his latest collection is a series of woodcuts made of the faces of well known western artists ranging from painters and musicians, to politicians, scientists and more. The works are amazing. Imposing, and yet welcoming, the carvings use a combination of dark and light to tell the story through the faces of these well known characters. Some are haunting and the others seem almost endearing. I’m no art expert, but I know how amazed I was by the level of complexity to his work – how each carving took so long to prepare and plan, how he created many different variations of the same work to contribute to a final piece, and how he told each individual’s story through minute additions to the carving that were blended in to the very faces. It was so interesting to see the different stages of each work, and to see how his works have changed over time. From a family of Buddhist farmers who originate in the north, Monthian finds these values translate over into his works with symbolism of both appearing in the form of wheat and lotus flowers, plus the use of water. I spent several hours hanging out in his workshop, watching him work, talking about art and Thailand. He was interested to hear about my travels, and although at times we had to struggle to translate certain words, we managed to have a really interesting chat about his background and his works. It was such an enlightening night and a great experience for someone who didn’t really know much about art to speak to someone who has dedicated his life to it. One of my favourite things about the evening was that while we chatted about art and life in Thailand, his family all sat on the floor alongside us and painted. 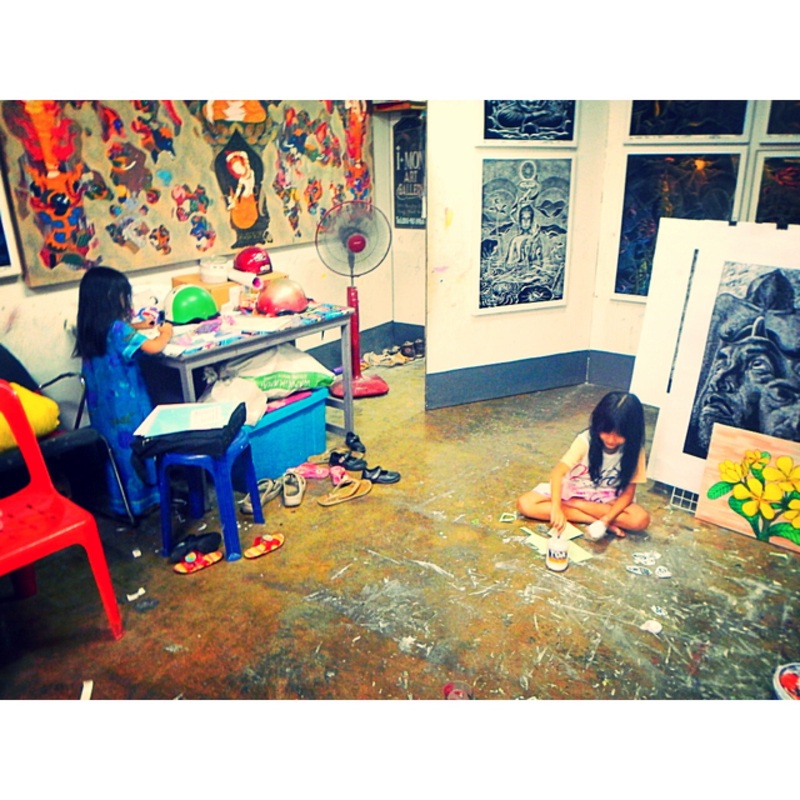 Such an artistic family, his wife was working on a painting of sunflowers, while his two beautiful little girls painted and made cut-outs. None of the three of them spoke any English, but they made me so welcome by showing me their paintings, offering me oranges and water. It was so touching to see how kind they were and how welcoming to a random person who walked in off the street, but it was a perfect example of the amazing Thai culture that has made me feel so at home in this amazing country. If you have the opportunity, I would definitely recommend you check out Monthians’s work – you can find more information on his Facebook page. 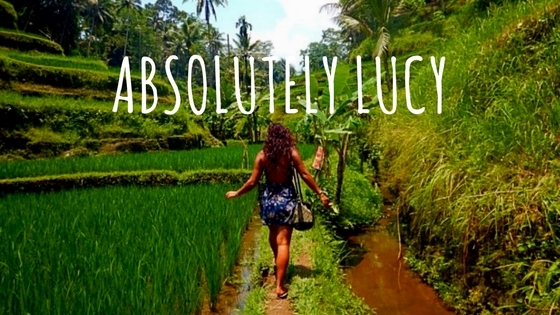 What are the most standout unplanned experiences you’ve had while travelling? How has a mix-up led to one of the most interesting nights of your life?